No invasive dll that you have to move to any folder and what not. Just Open up npp go to language->define your language->import and select the files. The file is incomplete, but when i get some time ill throw some more tags in there. I have been planning on working on something like this anyway. May I be allowed to contribute? I am hoping for an eventual minimum, of feature parity with TLDatLexer (the DLL method you mentioned). Not to mention that, said DLL file only works for 32-bit installations of Notepad++. I completely understand.. took me forever to get it to work.. to much copy/paste in a program directory. I prefer not to use things like that. (external plugin installation). not that its bad, its just something i prefer. As a show of good faith, an example you might try reverse-engineering (that I certainly plan to), is the Minecraft "Config Highlighter" UDL. See the associated screenshot. 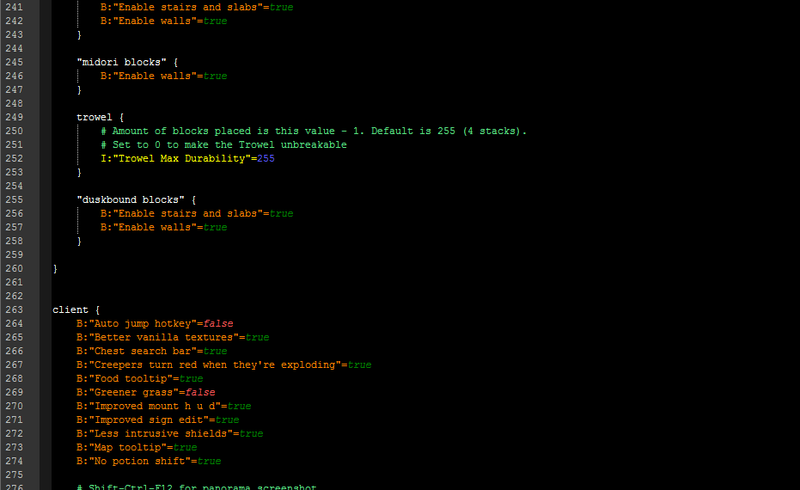 This is notable for the way it highlights config tags differently, depending on the tag type. I am still looking for a functional UDL example of code-folding (the other crucial feature of TLDatLexer). Let me know if you find one. It took me forever too—but not because I did not easily figure it out. I got the installation right on the second or third try…only to have Notepad++ refuse to launch due to the 32-bit DLL file. So then I procrastinated…and procrastinated…because I did not want to downgrade to a 32-bit app if a 64-bit app was available. I did eventually do it (the inherent utility of the plugin outweighed the performance benefits of avoiding it), but I did so reluctantly, and with much griping. Oh, and then I had to remove all traces of my Notepad++ 64-bit program directory—because it was somehow breaking my Notepad++ 32-bit file associations. Should be simple enough to just rebuild in a 64 bit architecture, ill reinstall Visual studios and check it out to see if i can get it to work. UPDATE:: Downloading VS over a tether is ... painful. @Urakka Amyx, I forked the TLDatLexer repository to Github, in case you would like to post any bugfixes or feature enhancements for it. Perhaps you can help me get AppVeyor working for the repository? The CI can do the actual compiling work, after that.